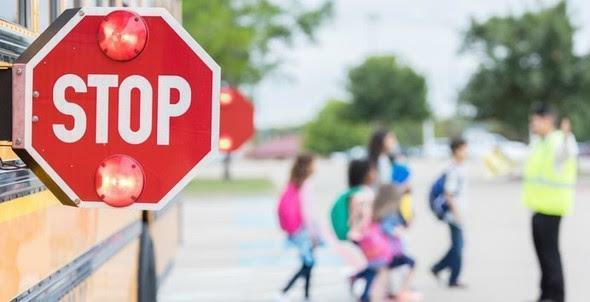 Obey the school bus laws in your State, as well as the "flashing signal light system" used for school buses. Red flashing lights and extended stop armsindicate the bus has stopped and children are getting on or off. Motorists must stop their cars and wait until the red lights stop flashing, the extended stop-arm is withdrawn, and the bus begins moving before they can start driving again. Arrive at the bus stop at least five minutes before the bus is scheduled to arrive. Stand at least three giant steps (six feet) away from the curb. The bus stop is not a place to run or play. Concern for the safety of students is spreading nationwide and it’s imperative that you take time to spread the word to your friends, families, neighbors, and followers.